Sources: FPL Annual Reports, FPL files, and personal communication from Peter Amirault based on FPL internal reports. The New Brunswick Department of Natural Resources (DNR) operates its Forest Fire Watch Web page. DNR has employed some of the FPL fleet to fight forest fires in New Brunswick since 1975. An FPL TBM dropping fire retardant in advance of a fire. 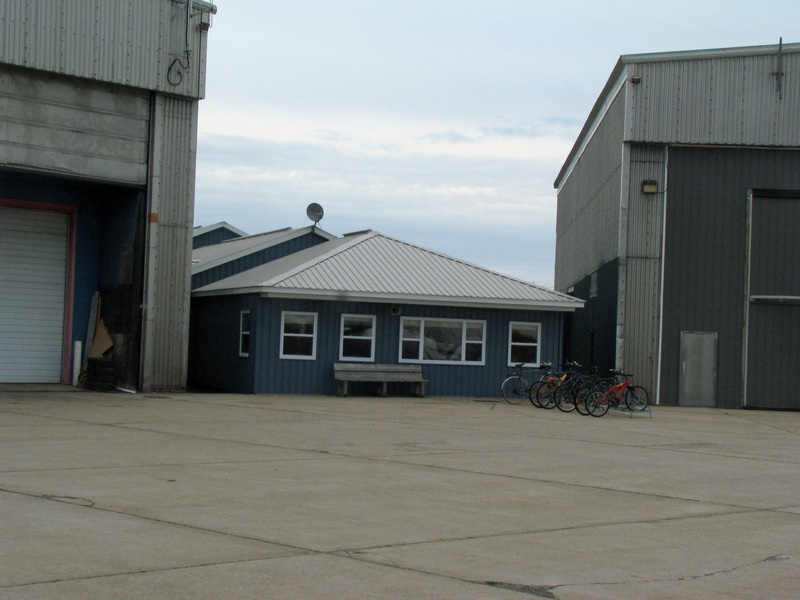 DNRE’s fire operations base was located at Dunphy Airstrip starting in 1975; in 1994, the base was moved to the Air Tanker Operations headquarters at Miramichi Airport. Sixty loads were hauled from Dunphy Airstrip from 29 June to 2 July on four separate fires over 38.25 hours. FPL also provided the Newfoundland Forest Service with two TBMs equipped for water bombing. The two TBMs [id not known] were stationed on stand-by at Gander Airport from 5 July to 10 July. No fires were fought. Pilots were C. Glass and R. Mereien. 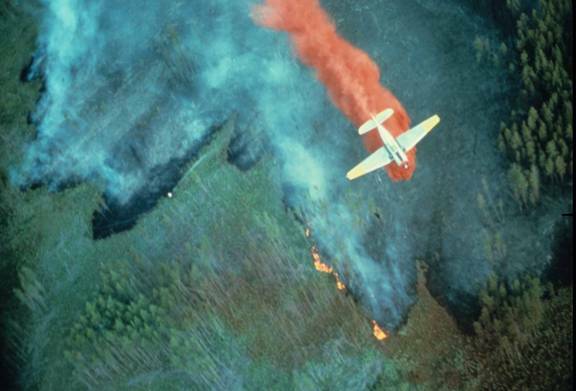 Prior to the completion of the 1976 larval spraying project, DNR was contacted regarding the utilization of FPL aircraft as fire bombers during the remainder of the fire season. As a result, an agreement was drawn up whereby FPL would supply suitably equipped aircraft, maintenance, pilots and necessary administration for an initial fee for conversion, plus a daily rate, plus an hourly rate for hours flown. DNR provided board and lodging for pilots and maintenance crew plus gasoline and oil consumed by the aircraft involved. Two TBMs [id not known] were converted, were on stand-by for two days and flew approximately three hours. No firebombing was conducted by FPL in 1977. Stand-by procedures were drawn up but never initiated. FPL contracted eight TBMs for fire bombing July 4 to August 8. Pilots were L. Jewers, K. Atkins, H. Koerfgen, B. Archer, A. Vallée, D. Kelly, B. Laird and R. Harrington. 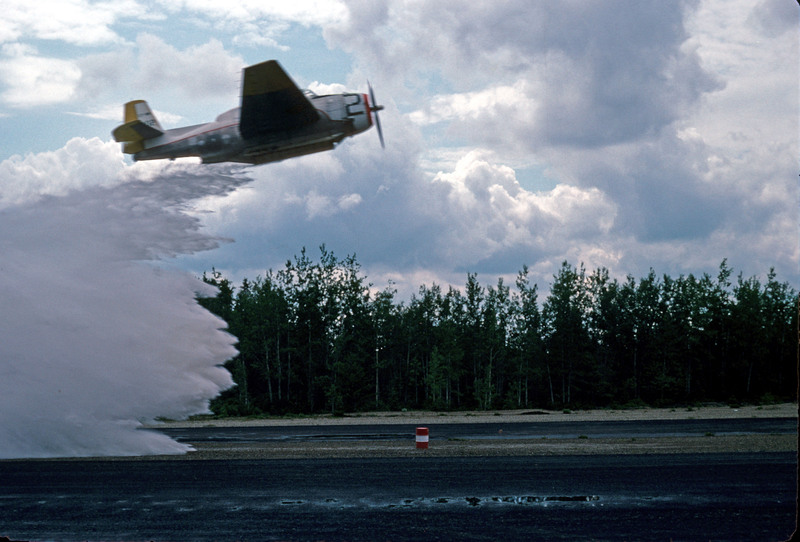 TBM #16 water bombing demo, Juniper Airstrip, NB, July 1978. 24 June, Juniper airstrip. 4 TBMs practiced fire bombing with a barrel on the runway using half-load drops, string drops and full-load drops. 4 July to 5 August, presumably Juniper. Fire bombing practice and bird-dog officer training at 4 hours per week. It was decided to use short-term retardant for stand-by and training at Juniper, while DNR would be capable of loading TBMs with short-term and long-term retardant at Dunphy. 5 and 26 August. First and last fire calls received. 35 fires were fought over 281.2 h, and 8 TBMs plus one spare were used. 30 August. Fleet reduced to 4 TBMs, but remaining aircraft were on stand-by until 7 Sep, when operations were shut down. 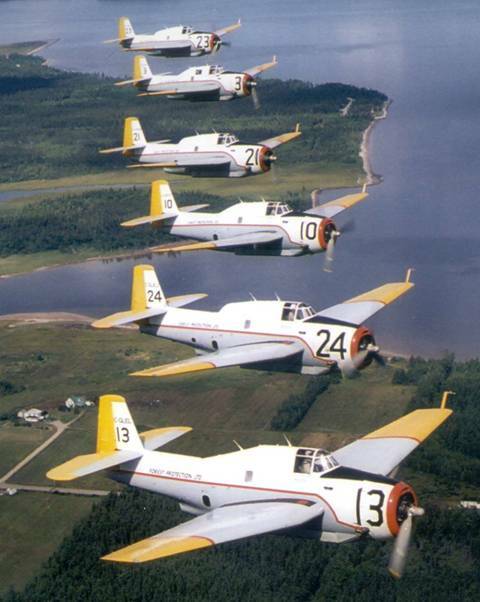 After the completion of larval spraying, a four-TBM Avenger fire bombing unit complete with bird-dog officer and Cessna 185 bird-dog aircraft was trained and maintained in a state of readiness by FPL. Training began at Boston Brook Airstrip, but the unit was based at Fredericton Airport where facilities of two loads each (eight TBM loads) of short-term fire retardant were set up. Reloading was to take place at Dunphy Airstrip or other suitable airstrip at the discretion of the NB Department of Natural Resources. Since it was considered as a backup unit only to DNR contract fire bombers, it was agreed that a 24-hour notice would be given by DNR for this unit to be put on “alert standby” status. Pilots were J. Gomany, R. Harrington, L. Jewers and A. Wall. The unit was disbanded on 20 August and worked on one fire (4 TBM loads). 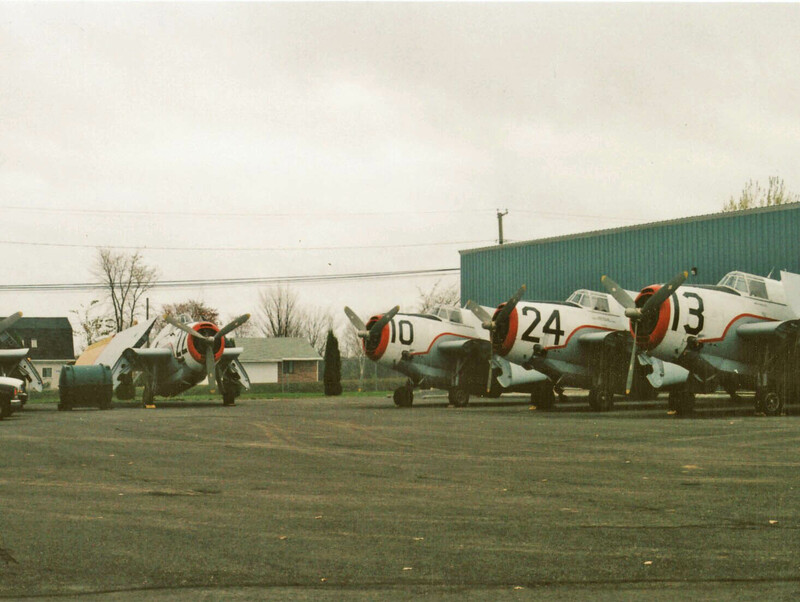 After the completion of larval spraying, a four-TBM Avenger Fire Bombing unit complete with bird-dog officer and Cessna 185 bird-dog aircraft was trained and maintained in a state of readiness by FPL. 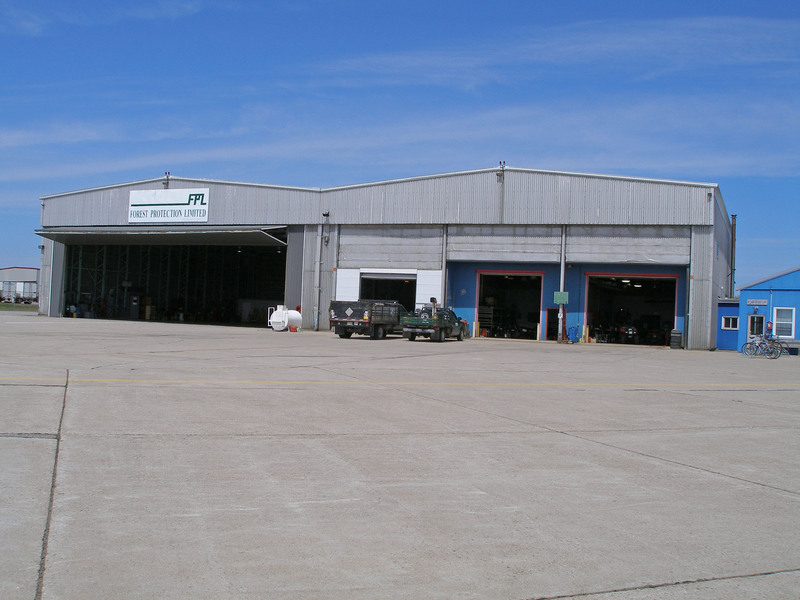 The unit was based at Fredericton Airport where facilities of two loads each (eight TBM loads) of short-term fire retardant were set up. Reloading was to take place at Dunphy Airstrip or other suitable airstrip at the discretion of DNR. The pilots were B. Farrell, R. Harrington, L. Jewers and T. Martindale. 4 July, Brockway airstrip. The 4 TBMs practiced fire bombing; also 6 sessions later in the month. 20 August. Fleet disbanded; worked on no fires. The unit was considered a backup to DNR contract fire bombers. FPL was not involved in fire suppression activities in 1981. FPL TBMs [id not known] were called out for firebombing on 26 May until 1 June. The TBMs flew for 9 hours, mostly on one fire. In 1983 FPL TBMs were not maintained in a state of readiness for firebombing as DNR felt that the extra expenditures for fire standby were not warranted. However, on 23 June, 1983, DNR requested that FPL provide six TBMs with associated aircraft as quickly as possible. Two TBMs plus one spare and bird-dogs were made available on 24 June, three more on 25 June and a sixth on 27 June. The seven TBMs [id not known] worked a total of 94 hours, and were released on 12 July, 1983. TBM CF-AGN crashed at the end of the runway on take-off at Charlo Airport, and was a complete write-off. Pilot John Wood was not injured. No FPL TBMs were required for forest fire control in 1984. 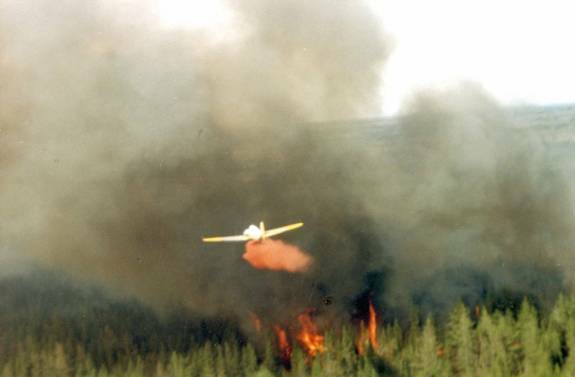 FPL aircraft were not required for forest fire control in 1985. For the future it was confirmed that particular TBMs should not be readied for forest fire suppression if they were more desirable for forest spraying. FPL was not involved in any fire bombing activities during these years. The TBMs used for fire suppression from 1990 onward were provided with tank systems that were totally different and more effective from those used previously. The decision to convert three TBMs to exclusive fire airtankers was made in 1990. The design and manufacture of the tanks were done by Conair and each aircraft was converted at considerable expense to have a tanking system that allowed for three different types of drops – full salvo, split salvo and a string drop. Prior to this FPL had been using pesticide tanks whereby the system for jettisoning a pesticide load in case of an emergency had been the same system used for dropping water or retardant. With the conversion of three TBMs into fire bombers, FPL played a major role in fire suppression activities during the 1991 fire season. These bombers responded to 400 fire calls out of a possible 404 throughout the season. Dunphy airstrip was the main base for the fire operations (8 May to 15 September), but other airstrips were also used. 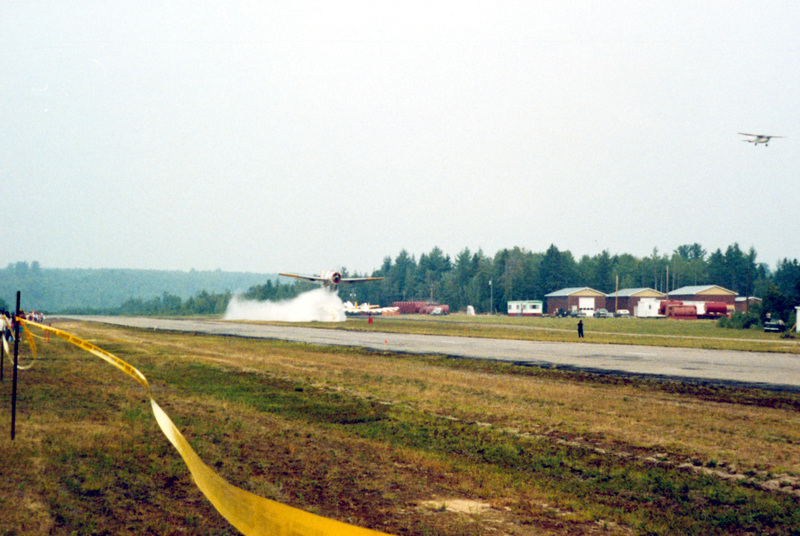 TBM #22 giving a public water drop demonstration at Dunphy Airstrip, NB, 1991. The five TBMs operated out of the main base at Dunphy for the 1992 fire season. All aircraft left Fredericton for Dunphy on 30 April. GFPS and FIMR returned on 15 September and GFPM, GFPL and GLEJ returned on 21 September. Full scale practice drops were carried out at Brockway on 7 May, 29 June and 8 August. A total of 713 loads were delivered over 432.5 hours flying time. Public demonstrations were carried out at the Fredericton Air show, 22 and 23 August (all 5 TBMs) and at St. Anne, NB, on 12 September (3 TBMs) [id not known]. This was the last year the TBMs were used for insect control; TBMs were now used solely for fire bombing. All aircraft left Fredericton for Dunphy on 30 April. GLEK, GFPM and GLEJ returned on 15 September and GFPS, GFPM and GLEJ returned on 16 September. A total of 333 loads were delivered over 234.4 hours (average 39 h). The same six TBMs operated out of DNR’s fire bases at Fredericton and Miramichi for the 1994 fire season, plus one spare at Fredericton. The spare aircraft was #13 GLEL. Practice drops were conducted at Brockway 26 and 29 April. The aircraft operated out of Fredericton 1 May to 12 June, 1994. All aircraft left Fredericton for Dunphy on 12 June. GFPM and FIMR returned on 15 September and GFPS, GLEK, GFPL and GLEJ returned on 16 September. A total of 317 loads of all retardant types were delivered. Operational training was conducted at Fredericton Airport 19 April. All aircraft except GLEJ left Fredericton for Dunphy on 1 May and returned on 22 September. The aircraft fought 112 fires during the hot and dry summer and delivered 1090 loads, which was a dramatic increase over the previous two years. 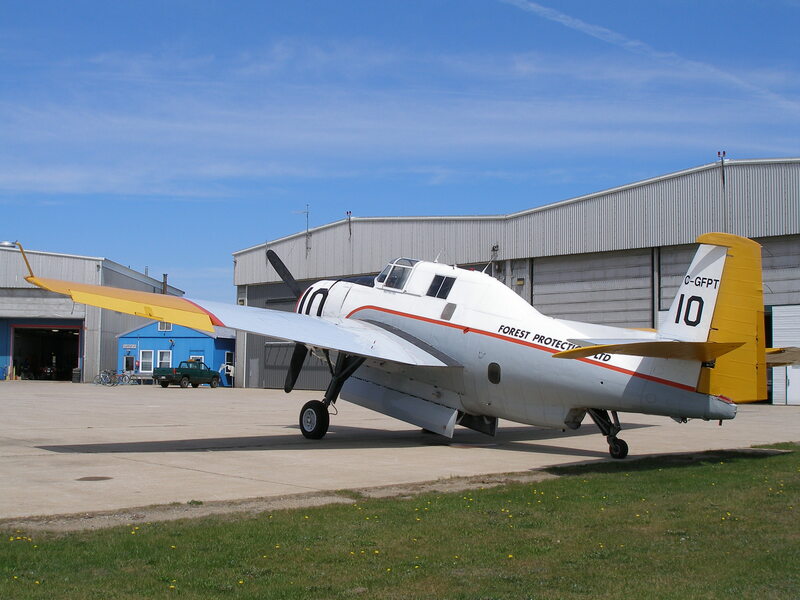 GLEJ returned early to Fredericton on 19 August and was replaced by an Air Tractor 802A, which was undergoing a one-month trial to assess its value as a fire bomber. Operational training was conducted at Fredericton Airport 19 April. All aircraft left Fredericton for Miramichi on 29 April and remained until 22 September. The six TBMs fought 54 fires and delivered 515 loads. Operational training was conducted at Fredericton Airport 22 April. All aircraft left Fredericton for Chatham on 25 April and returned on 13 September. The season was not particularly busy. The Avengers participated in the Miramichi International Air Show at the Miramichi Airport in June of 1997. The spare GFPM was activated after the crash of #14 GLEK on 16 August. Operational training was conducted at Fredericton Airport 21 April. All aircraft left Fredericton for Miramichi on 25 April and returned on 12 September. The season was not particularly busy; only 16 fires were worked on. 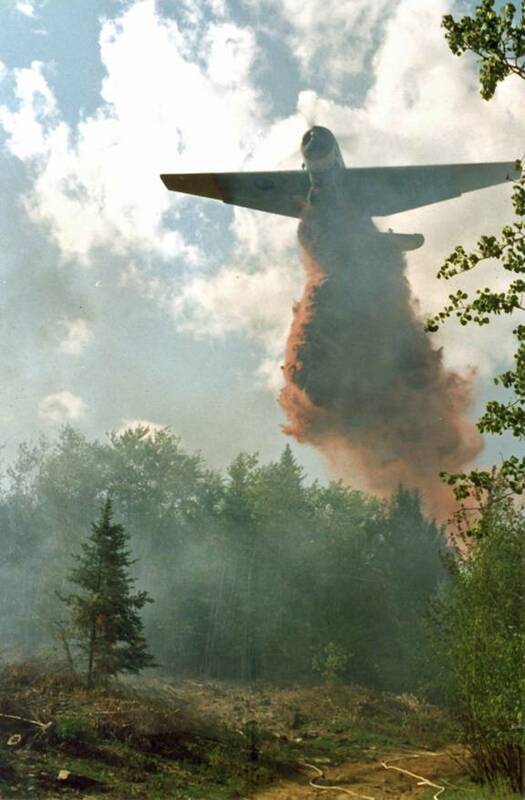 The Avengers carried out a fire bombing demonstration near Charlo for the private Woodlot Owners’ Field Day, sponsored by DNRE before returning to Fredericton on 12 September. The spare #13 GLEL was activated after the crash of TBM #17 GFPN on 1 May. 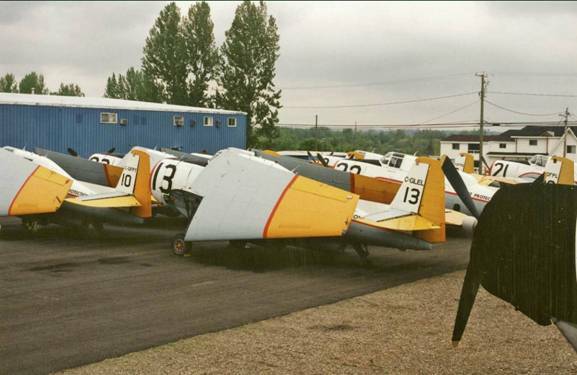 GFPN had replaced #14 GLEK, which had crashed in 1998. Operational training was conducted at Fredericton Airport on 16 April. All aircraft left Fredericton for Miramichi on 21 April. The last of the Avengers left for Fredericton on 15 September. The season was one of the busiest on record for the FPL team. The spare TBM, #21 GFPM, was activated following an accident involving TBM #22 GFPL on 14 June. Operational training was conducted at Fredericton Airport on 17–18 April. All aircraft left Fredericton for Miramichi on 18 April. One team was released on 11 September and the second on the 15th. The season was the quietest in years. 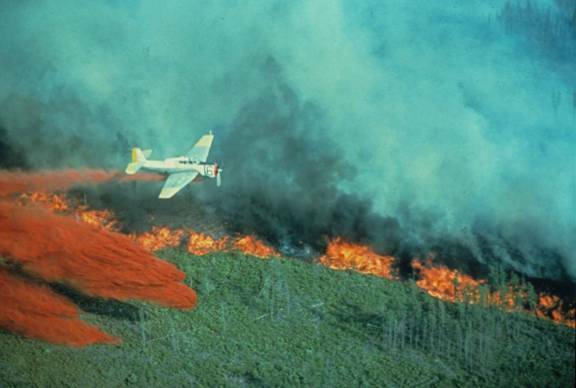 A committee was formed to evaluate aerial forest fire protection options for replacing FPL’s aging TBM air tanker fleet. It was mandated that future aircraft have a dual role capability (aerial spraying and fire bombing). The spare was used as a seventh air tanker for a few days during a period of extreme fire hazard during August, the driest part of the fire season. All aircraft left Fredericton for Miramichi on 29 April. One team was released on 21 September and the second on the 22nd. The 2001 fire season was covered in an excellent article by the late Marshall Lumsden with photography by Chad Slattery, “The Avengers, Firefight”, Air & Space, November 2001, cover, plus pages 62 to 71. The famous photo of the FPL fleet in the air, 2001. Three TBMs and three AT802s operated out of DNR’s Air Tanker Base at Miramichi for the 2002 fire season, plus one spare at Fredericton (GLEJ). GLEJ was activated later during a low demand period after two 802s were sent out of province. Fire activity and missions were well below average after a period of significant activity at the end of May. 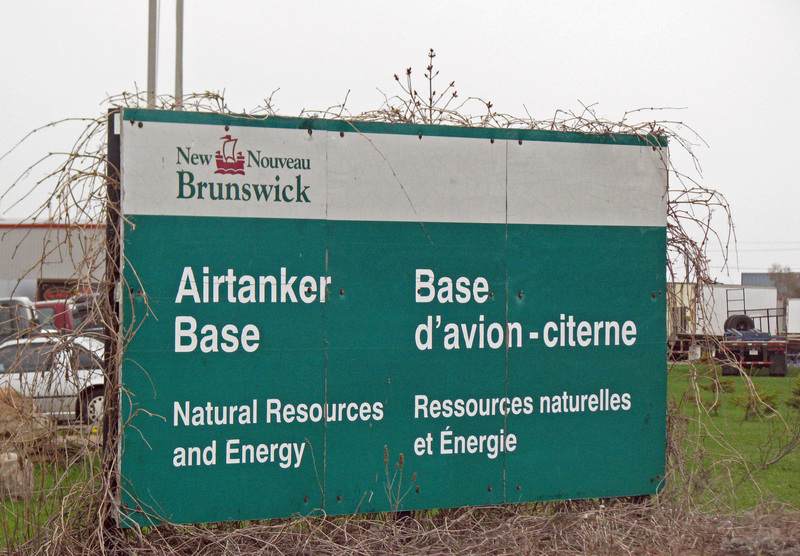 The company positioned six AT802s at the DNR Air Tanker Base in Miramichi. This was the first time the season began with a full complement of AT802 aircraft. In July the fire hazard and demand for resources were low enough that three AT802s were sent to BC to supplement resources in that province under the shared tanker resource program. Two TBMs were activated to cover contingencies in NB, but flew zero hours for fire suppression. TBMs in storage at FPL, 2003. FPL positioned six AT802s at the DNR Air Tanker Base in Miramichi. In late June the fire hazard and demand for resources were low enough that three AT802s were sent to BC and later Idaho to supplement resources there under the shared tanker resource program. Three TBMs were activated to cover contingencies in NB, and flew 11.0 hours. Three TBMs formerly used for fire bombing were sold in 2004. TBMs stored for winter, September 2004. FPL positioned six AT802s at the DNR Air Tanker Base in Miramichi. For the second half of the season, three TBMs were activated to cover contingencies in NB, while three AT802s were sent elsewhere. The TBMs flew a total of 64.8 hours for fire suppression. FPL positioned six AT802s at the DNR Air Tanker Base in Miramichi. Three TBMs were activated to cover contingencies in NB, while some of the AT802s were sent elsewhere. The TBMs flew a total of 7.7 hours for fire suppression. FPL positioned six AT802s at the DNR Air Tanker Base in Miramichi. At various times during the season, three TBMs were activated to cover contingencies in NB, while some of the AT802s were sent elsewhere. The TBMs flew a total of 78.5 hours for fire suppression. The Company positioned six AT802 air tanker aircraft at the Department of Natural Resources (DNR) Air Tanker Base in Miramichi. At various times during the season, three TBM air tankers were activated to cover fire suppression needs in New Brunswick. The TBMs flew a total of 28.4 hours for fire suppression. FPL positioned six AT802F air tanker aircraft at the Department of Natural Resources (DNR) Air Tanker Base in Miramichi. At one point three TBM air tankers were activated to cover fire suppression needs in New Brunswick while three AT802s were sent to Quebec. FPL positioned six AT802 air tanker aircraft at the Department of Natural Resources (DNR) Air Tanker Base in Miramichi. The three remaining TBMs were activated for the fire season, but on April 23, 2010, #22 C-GFPL, crashed while conducting a practice flight resulting in the death of the pilot, Ron Clowes. See the GFPL history page for more details. This was the last year that TBM Avengers were used to fight fires in New Brunswick. The last two remaining TBMs were sold, C-GLEL in 2011 and C-FIMR in 2012. Neither was assigned to any duties, and the only hours flown would have been in preparation for departure. FPL continues fighting fires with its fleet of AT-802s. Worked along side the NB Spray Program since 79 and with the Avengers in the fire program when they were re-tanked in 91 till they were decommissioned over 10yrs later as the primary fleet and replaced by the AT802s. Sevogle-ized, been awaken at dawn by the whine of the 185 heading out for weather checks, then sung back to sleep by the rumbling roars of spray teams reloading and returning on a morning spray. Working to sunset under the wings in the prop wash loading long term and sending them back out on what I remember to be some of the worst fire seasons in NBs recent history. Flying home in perfect formation after a day of bombing, choking smoke, and if lucky your were able to eat dusty gritty bread, corned beef and chunks of cheese served off the service truck that chased the fleet all over the province. It’s websites like these that keep the memories fresh for us who was there and a perfect historical account for those with an interest in learning about the industry and it’s past. Exceptional and detailed Record of FPL’s Avengers and Pilots. Thank you for sharing! Paul Alexander: I was a pointer at Dunphy in 1966. My job was to fill in a long the rivers after the Avengers sprayed DDT up to 600 feet from the river. We used a team of Ag cats and sprayed organophosphates. The lead Ag Cat pilot was Jim Fuels. The next five summers Iwas the chief pointer at Juniper. There I flew with Bunker McDevit and George Legere. We survived a mid air collusion in CF UIQ. I did get to stole away on one spray flight in an Avenger. Those were great days, I would have done the job for no pay, but it did pay my way through medical school. Dale, I’m always looking for more info. You can contact me at cadam AT nbnet.nb.ca. So sad these noble ships have made their last drops. I recall the summer of 1970 on the Flathead National Forest and my father working ground crew supporting these mighty craft. A legacy gone by. Makes one wonder if the new crafts will last half the time as these old warbirds. Farewell friend. Your memories will be with us for eternity.